Marsha is regularly commissioned to create original works of art that are displayed in private residences as well as corporate and public settings throughout the country. Her adage is curiosity leads to discovery leads to inspiration. It is the common thread that weaves through her life-long love of visual art and colors her application of ceramics and mosaics. Keenly combining handmade ceramic tile and sculptural elements with brightly colored glass, Marsha creates custom designed pieces that catch the eye of casual observers and seasoned artists alike. She loves the sensuous quality and malleability of clay as well as the endless possibilities it provides for creating textures and shapes. The juxtaposition of handmade tiles and embellishments with stained glass, smalti, or found objects creates a particularly stimulating and pleasing contrast. 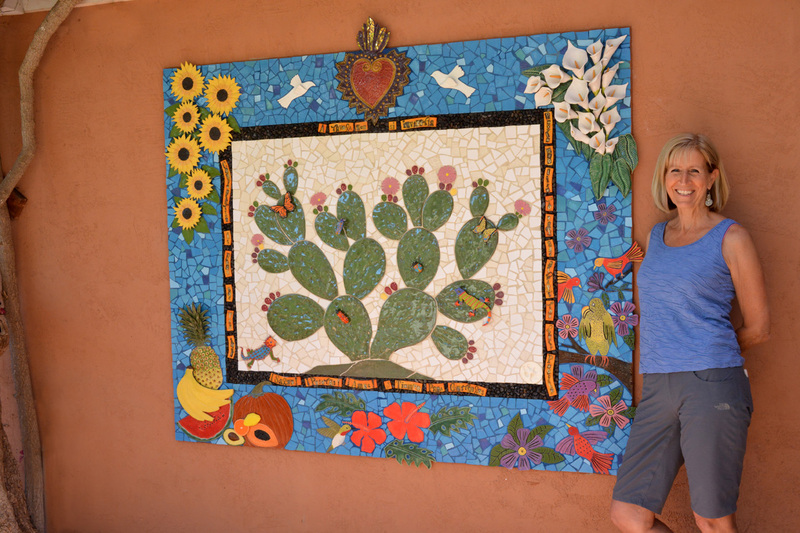 Tightly aligned with Marsha’s love of mosaics is her passion for teaching. Marsha nurtures students through guided lessons and self-directed open class time in her studio each week. She travels worldwide to teach and attend workshops and her travels are a continuous source of inspiration. Ellen Blakeley, Tempered Glass Mosaics. Sherri Warner Hunter, A Lighter Base for 3-D Mosaics: Polystyrene Forms & Polymer Fortified Concrete. Laurel True, Mosaic Mural Making Intensive. Mosaic Mandala – Connecting With Your Inner Muse. Donna Billick, Creating ceramic elements, plaster casting, and constructing 3-D Public Art. Marian Shapiro, Moving into the Third Dimension – Making and Working with Dimensional Substrates. Laurie Mika, Mixed Media Mosaics with Polymer Clay. Mireille Swinnen, Working with Smalti. Kelly Knickerbocker, Radical Dimensions in Glass Mosaic. Lynn Takata, Creating Substrates in Concrete and Ferro Concrete. Kim Wozniak, Breaking barriers and Conquering your Mosaic Walls. Bonnie Fitzgerald, Discovering Opus and Andamento: Mindful Hand-cutting and Laying Mosaics with Precision. Sharra Frank, Sculpted Mosaic Mirror Frames. Glass on Glass Window Hangings. Jessica Liddell, Collaborative Mosaics – Working with schools, Hospitals, and Community Centers. Julie Richey, Getting to the Next Level. Helen Bodycomb, Inspiration, Drawing and Design in Mosaics. Rachel Rodi, Working Direct: Mosaic Stepping Stones. Rachel Sagar, Walking the Line.